Can I map additional SMB2 network shares for LS220D - other than 'Share'? I have all my PC's upgraded to Win10. I lost network drive access to my LS220D at this point. So I allowed the firmware upgrade and enabled SMB2. 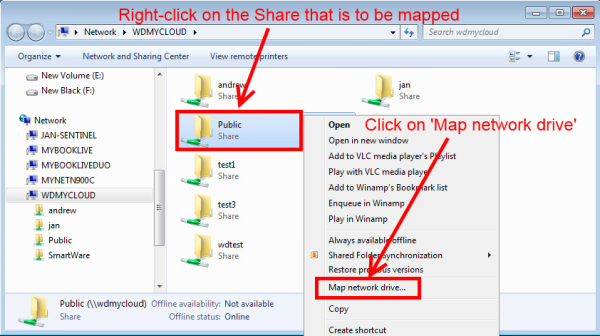 NAS Navigator 2 allows me to map the 'Share' folder share OK, but there are other shares I wish to access on the NAS, via windows 'Map Network drive'. The only way I can see to do this is to open up the NAS Navigator 2 and double click on my LS220D in the interface. This brings a windows explorer with my list of shares on the NAS, and I can navigate to them in that. Is there a way to manually add some of these shares on my Windows with 'Map Network drive' rather than have to use NAS Navigator 2 every time. Re: Can I map additional SMB2 network shares for LS220D - other than 'Share'? Cancel that - sort it it. I see you have like I, an LS220D and wonder if you could answer a question based on your experience. My trouble is that I cannot access the shared folder on the LS220D as a network share from my media player.. But all I want to do is access the Nas when it shows up as a network shared folder... (I have other buffalo Nas and they show up as a 'small network icon').. so my question is does yours and can you access the files..? does it ask for user + PW..? which PW..? admin of the Nas or network user+pw, or anonymous+blank? thanks in advance for any help you can offer.. This all changed when Microsoft disabled SMB1 in Windows 10. I assume this is what you have on your PC?? I also assume you have SMB2 enabled via the LS220D menus. and therefore as you say can setup the 'share' network drive via the NasNavigator. To add other shares from the LS220 you can't get to them via the 'Network' icon in Windows Explorer, you need to manually add a new Mapped Drive. This is done in Windows Explorer when on the ‘This PC’ icon. This works fine assuming you have granted sufficient access to that share on the LS220D. That doesn't work with Win10 and disabled SMB1 (such as you get by default with Win10). My post above explains what needs to be done. thanks Stagger321, SMB2 is enabled on the LS220D, yep. but my issue is accessing the shared folders on the LS220D from my network media player... I have no probs accessing the shared folders and their files from my Win7 PC's. The media player sees the Nas drive and asks for a PW and will show the shared folders.. so far so good... but then when I try to open a shared folder, the "scanning" icon continues to show 'forever and a day'. So my Q is, does your LS220D give you access to the shared folders and their files from a network media player..? when DLNA or similar is turned off. does it ask for a PW, if so what PW is it asking for..?